Navy Secretary Ray Mabus thinks that the Littoral Combat Ships are so ‘misunderstood,’ not for the litany of documented issues, including the ship’s lacks offensive punch, inability defend itself against any robust aerial threat, the fact that it is way behind schedule and has major quality issues or that it is not survivable in combat, but because of its ‘confusing’ LCS moniker. So now the Navy’s questionably relevant Littoral Combat Ships will be called... Frigates! Yes, you read that right, the Littoral Combat Ships, the Navy’s hulking shallow-water jet boat with an internal identity crisis, will now be re-badged as Frigates and carry the designation FF. Note that this is not the same FFG designation like their beloved but neglected Oliver Hazard Perry Class forerunners. Unlike the LCS, the FFG-7 Oliver Hazard Perry Class are extremely tough and tested ships, built to survive direct attacks from enemy anti-ship missiles and mines, which they have done during their 40 year career with the US Navy. 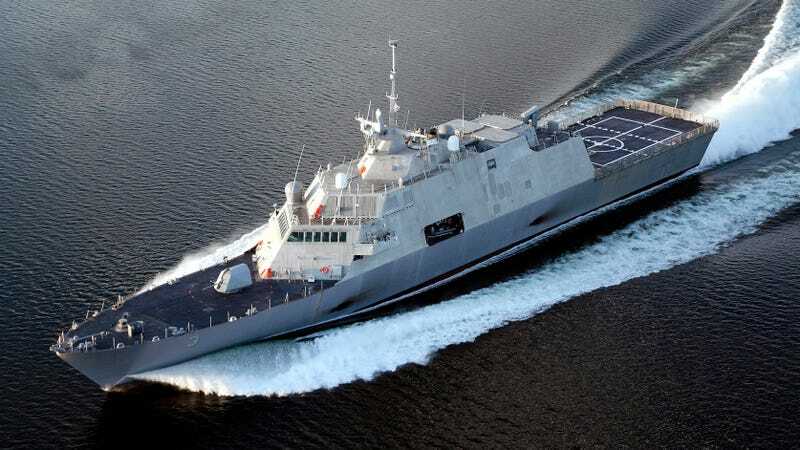 The lack of the ‘G’ in the ship’s new designation is because the Littoral Combat Ships don’t have an area air defense guided missile capability, or any over-the-horizon guided missile capability for that matter, like the Perry Class originally had. This is one of the biggest criticisms of the LCS program as a whole. Even the next wave of ‘enhanced’ LCS designs, which many see as an astonishing double down on the failed LCS concept by the Navy, will lack area air defense as well. Considering these ships are not hardened like their predecessors and that anti-air systems naval systems have become smaller and more adaptable than ever before, this omission seems jaw-droppingly stupid. With all due respect Mr. Maybus, nice try, but if the LCS was a Frigate you would have called it a Frigate in the first place. Like so many other things DoD these days, there is no need to cancel failing weapon systems that are of questionable utility, instead just keep the marketing hot and keep telling the masses how innovative the thing is whether it works or not. Oh, and make sure to keep doubling down on it so we have spent too much money to ever turn back. If the Navy actually wanted a proper frigate to replace the Oliver Hazard Perry Class they could have had their pick of multiple indigenous and foreign nearly off the shelf designs that pack much more combat effectiveness that the big LCS jet boats. But whatever, apparently if you are high enough in the chain of command these days inside the Pentagon you can close your eyes and clench your fists hard enough to make make any square peg weapons platform fit into a round hole capability requirement. In the end you can put as much lipstick on an LCS as you want, but guess what, it is still an LCS.